﻿﻿Two outstanding Quebec poets, Yolande Villemaire and Claude Beausoleil, present two compelling poems in parallel texts in English translation. 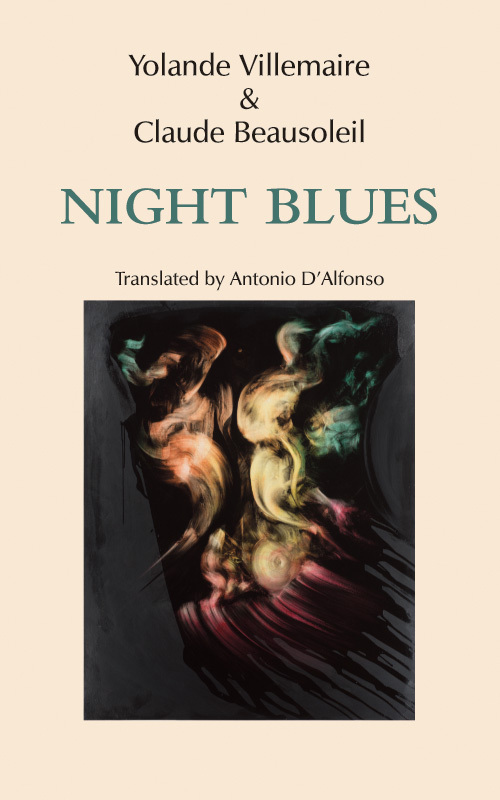 The two poems, Jack & Billie in the Blues of Night and Violet Night, although dissimilar in tone, are braided by a common vision as congruent as night belonging to day, becoming the transformative book Night Blues. Rimbaud wrote “I turned silences and nights into words. What was unutterable, I wrote down.” Yolande Villemaire, the author of many important volumes of poetry and prose in French, seems to arouse the spirit of Rimbaud in savoury passages awakening the inner poet. The poem burns with an incandescent fire as the poet surrenders to the “violet night,” in a cryptic and sibylline poem meant to be sung and chanted from within the mystic spirit. As the poète maudit writes in Le Bateau Ivre, “I make the whirling world stand still.” Claude Beausoleil’s Jack & Billie in the Blues of Night is a homage to Billie Holiday and Jack Kerouac, who met in some smoky bar in the heart of the United States. “Jack, / what you say to Billie / on this American night / is your special way of jazzing up energy / Black Billie you listen…” Beausoleil infuses a beat spirit into his couplets and sings about this 1946 meeting between Kerouac and Holiday, who sang “Lover Man” like no one else could. They who were proficient in the language of ramblers were very much aware that their paths would inevitably meet. ﻿Yolande Villemaire is one of Quebec’s most prolific writers, proficient in both poetry and prose. She has given poetry readings and performances around the world. She has lived in New York, Paris, Amsterdam and India. Her novels have been translated in English and in Italian: her poetry has been translated in English, Spanish, Italian, Romanian, Catalan, Dutch, German, Icelandic and Russian. Her novel La vie en prose won an award from the Journal de Montréal in 1980 and her poems L’armoure received a Radio-Canada award in 2002. She also received a Quebec-Mexico poetry prize in 2008 and the Career Award from Quebec Councitl of the Arts and Letters in 2009. Also in 2009, she was a guest of honor at the Festival de la Poésie de Montréal. She has published more than twenty-five books, five of which are available in English translation from Ekstasis Editions: Midnight Tides of Amsterdam, Poets & Centaurs, India, India, Little Red Berries and The Cygnus Constellation. She has also published a book of poems written in English Silence is a Healing Cave (Ekstasis Editions, 2013). Her last novel Le rose des temps, was published in 2017 by Druide Editions. Yolande Villemaire lives in Montreal and is the director of TOTEMPOÉSIE. ﻿Poet, novelist, literary critic born in Montreal in 1948, Claude Beausoleil published more than sixty books, starting from Intrusion ralentie in 1972. Among his recent poetry collections, many of them published in Paris: La Blessure du silence (Louise-Labé award), Black Billie (SGDL award), Amerikerouac, Mystère Wilde (Heredia award from l’Académie française) and Cette musique de Keats in 2017. In prose, he published the novels Fort Sauvage and Architecte des sentiments and more recently Alma, fragments about his poetry apprenticeship in the Montreal of his childhood. He aslo published essays about poetry: Les livres parlent, Extase et déchirure, Librement dit et Le motif de l’identité dans la poésie québécoise. His poetry is translated in more than a dozen languages, mainly in Spanish and English. Claude Beausoleil is also the author of anthologies of poetry from Switzerland, Acadia, Quebec and Mexico. Director of Lèvres urbaines, a poetry review he founded in 1983, President of Honor of the Maison de la Poésie de Montréal, member of the Oscar Wilde Society, Claude Beausoleil has been decorated by l’Ordre des francophones d’Amérique. Since 1997, he has been a member of the prestigious Académie Mallarmé in Paris. He has been the first poet laureate of Montreal, his hometown.